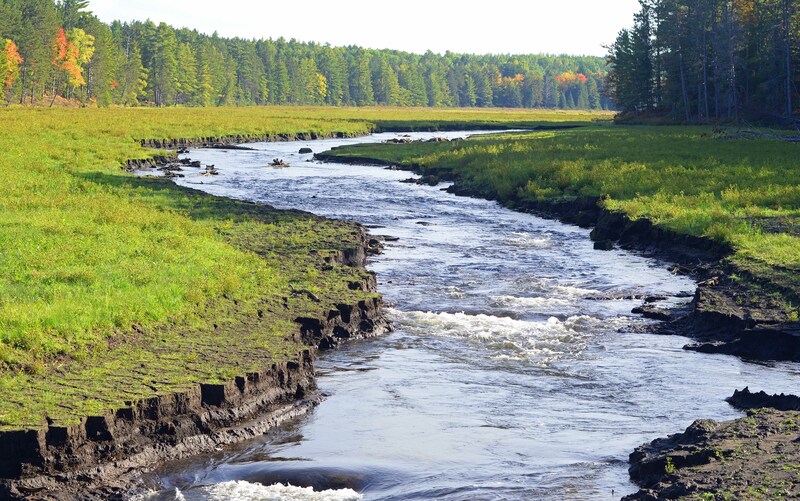 VANDERBILT, MI – The Pigeon River, north of Vanderbilt, is once again flowing freely through the Pigeon River Country State Forest. The last of 23 stop logs in the Song of the Morning Ranch yoga camp dam was permanently removed Sept. 11, allowing the 47.4-mile Blue Ribbon trout stream, and state-designated “wild-scenic river,” to run unencumbered from its headwaters to Mullett Lake. The impoundment drawdown began in May and was overseen by DEQ. One 4-inch steel stop log was removed every three days to meter out the accompanying silt flow and let it wash through the river system. It is the first of several steps in the lengthy process ahead to completely remove the dam and restore the landscape. A permanent drawdown was called for in a settlement negotiated between the state and Golden Lotus Inc., which operates the Song of the Morning Ranch. Golden Lotus was fined $120,000 to mitigate the effects of its most recent 2008 silt spill from the dam, a catastrophic event that killed an estimated 450,000 trout. 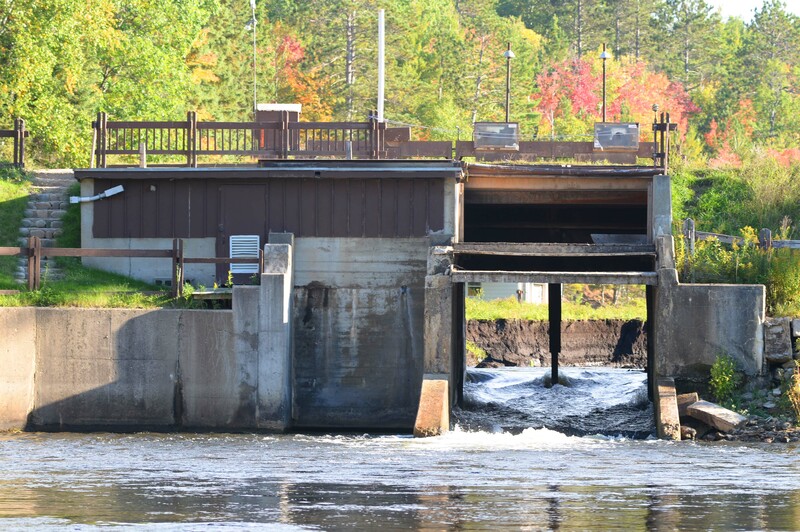 A collaborative agreement regarding restoration of the river, between Golden Lotus Inc., Trout Unlimited, and the Pigeon River Country Association also calls for deconstruction and removal of the dam and the building of a bridge over the river in Phase II of the project. “This is the first year where through the summer there wasn’t a pond there acting like a solar (collector),” said Tim Cwalinski, a senior fish biologist from the Michigan DNR’s Gaylord office. “We surveyed the fish at Elk Hill, which is five miles downstream, and the number of legal-sized brook trout is low, but the numbers are similar to the 7-year average. They were really low after the dam malfunction in 2008. That flood also hit juvenile steelhead (rainbow trout) hard. The number of 1-inch and 2-inch juveniles was “extremely low,” according to Cwalinski. Pawloski said the drawdown went well. Golden Lotus Inc. did its part and met the conditions of the DEQ permit. The dissolved oxygen content, for example, remained consistent. “It was a big science experiment, and monitoring confirmed what we expected,” Pawloski said. “The experiment was to see how quickly we could remove the stop logs and have the river recover. “We’ve upset the apple cart. The river cutting down (through the muck) will continue even after we’ve removed the final pieces of the dam structure, but at some point in future years we will see the whole system come back into equilibrium,” he said. Residents along the river complained and expressed concerns throughout the drawdown, according to Cwalinski, who fielded their calls about turbid waters. Emptying the more than 40-acre impoundment is expected to return about a mile of river to its natural state. That, in turn, will result in cooler downstream water, better for trout and trout reproduction. Lisha Ramsdell, Phase II project manager with Huron Pines, a conservation and resource development nonprofit in Gaylord, said her organization will be managing dam removal and construction of the bridge. If all goes well, Phase II could begin in 2015. Funding is being sought for the necessary steps. “The drawdown was really important, but without dam removal you don’t get fish passage,” Ramsdell said. “We hope we don’t run into anything unknown. The dam has been there for over 100 years. “We’ll be working through the winter to get permits and a construction contractor to get lined up for dam removal in 2015, ideally,” she said. This entry was posted in Uncategorized and tagged Conservation, Dams, Environment, Golden Lotus Inc. Song of the Morning Ranch, Huron Pines, Michigan Department of Environmental Quality, Nature, Pigeon River, Pigeon River Country Association, Pigeon River Country State Forest, State Forest, Trout, Trout Unlimited, Vanderbuilt, Yoga Camp. Bookmark the permalink.